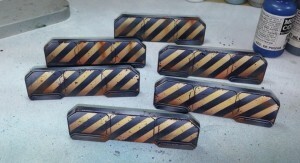 Defiance Games gives your little mans some cover with their new Hard Plastic Containment Barriers, available now. 5 hard plastic frames with 3 barriers each - 15 barriers will create over 45 inches of cover on your tabletop! There are four deals to choose from - Single Barrier Set, 4-Box Set, 10-Box Set, or a special combo set with 2 boxes of barriers and 4 of our hard plastic shipping containers for $99 with free worldwide shipping.